Well the weather forecast wasn’t brilliant, but it didn’t dampen the true Classic Car Club spirit and 20 cars took part in the event organized by Sue and myself. The object of the exercise was to find, using the photos provided, the 6 indicated locations and then take the longest straw available. 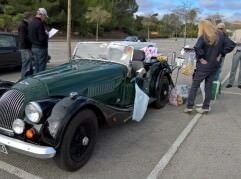 After congregating at the Festival Park where tea/coffee and croissants were provided, the drivers were handed their maps and directions and the rally begun at 11.30hrs, fortunately in dry weather conditions! 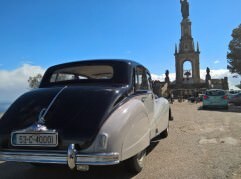 Cars started to arrive at the Puig De Santa Magdalena restaurant after about 2 hours, and a commendable drive was made by our President, Peter whose XK lost a clutch, but he still made it to the summit! After an excellent 4 course meal, complete with wine and coffees the winner was announced and Paco driving his Ford Mustang received the 1st prize. 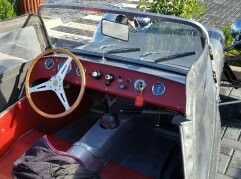 As some members did take part in their normal cars, the 2nd prize was awarded to Arthur Richards who completed the course in his Alfa Romeo. A great day was had by all, and fortunately the weather was kind to us, although for some, the journey home was not so good!